Manufactured as per the set industrial standards, the quality of the offered Industrial Telephone with Amplfier Type Paging System is never compromised. 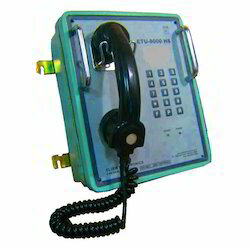 We are among the reputed names in the industry for manufacturing and exporting Industrial Telephone with Amplifier Type Paging System. The offered product has been procured from a credible vendor base and regarded for its impeccable features. It consists of an EPABX unit and all the field industrial telephones have built in page amplifier. The offered system is capable of accessing all the field stations individually and in group as well. Other standard features of a digital system are available in this epabx system. We have set a benchmark in the industry for manufacturing and trading Industrial Telephone Station. The offered product is sturdy and the housing is made from high quality of aluminum. It is equipped with an expanded set of number keys which are easy to dial and a comfortable microphone with handle. This telephone station is suitable to be used in industries including civil engineering, mining and metal. Operation : The unit operates with a standard Epabx unit. The field operator lifts the handset and dials the required extension number. If the dialled extension is free, the person at this extension responds by lifting the handset of its telephone unit and continues with the conversation. Once the conversation is over, the handset is put back on the telephone unit. Whenever a field operator wishes to make a paging announcement to a particular zone, he should dial the assigned telephone extension no. for the particular zone. In case the assigned extension is free, he will hear a ring back tone and immediately should start making the intended page announcement. This page announcement is heard in all the loudspeakers connected to the particular zone. The required person listens to the announcement and then contacts the calling person from a telephone extension. Looking for Industrial Telephone with Amplfier Type Paging System ?